When we eat at our local Islands Burgers, I always end up ordering a fish taco with cabbage. This is very out of habit for me, because I usually order something new, something I have never or would never cook at home. This is the exception. I am not crazy about frying too much at home, simply because it makes my kitchen and most of the house smell. So fried fish at home is a rare thing. When I put this dish together, I wanted a fresh seafood taco with a kick. Enjoy. Soak wooden skewers in water, if grilling. Mix the spices, sugar and olive oil. Rinse, peel and devein the shrimp. Toss the spice mixture over the shrimp and make sure, they are all coated. Heat outdoor grill or indoor stovetop to medium-high. Put shrimp on skewers, grill about 2 min on each side or cook 3-4 min in a skillet. Grill the tortillas about 30 sec per side or warm in oven or microwave. 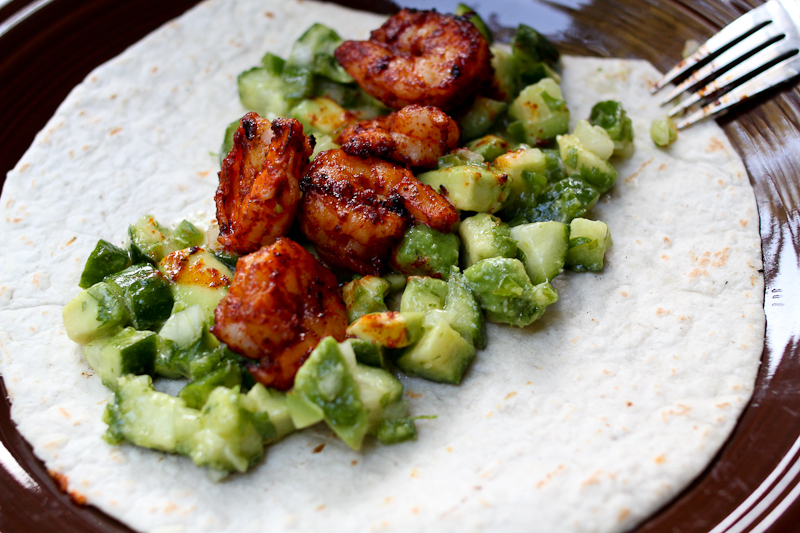 To serve spoon some salsa on the tortilla, then top with 4-5 shrimp and fold. Cut the avocado and cucmber in small chunks. Cut the onion and jalapeno even smaller. Chop the cilantro and mix all the ingredients in a bowl. Drizzle olive oil on top and squeeze the lime over the salsa. Stir the salsa gently and season. This entry was posted in Dinners in 30 min or less, From the sea, Latin flavors and tagged avocado salsa, cucumber salsa, dinner, Dinner in 30 min, fish tacos, recipes, rejer med tacos, salsa, shrimp tacos, tacos. Bookmark the permalink.